Every home requires an HVAC system that is energy efficient, low maintenance, cools or heats quickly and provides clean air. But being noiseless is another important characteristic of the perfect HVAC system for your house. Whether you have a small or a large HVAC system, you won’t be comfortable in your house if the system is very loud. You do not want to be woken up at night nor have your conversations interrupted due to the whirring of the fan or the shutting off and switching-on of the machine. If you understand the various causes of sound in HVAC systems and the features that help reduce noise, you can choose the right system for your home that won’t cause you any disturbance. HVAC systems are complex machines that have many parts working together. These parts make noise due to vibrations that occur when the machine is running. The starting and stopping of the fan is one of the biggest reasons of noise in HVAC systems. Often broken twigs and leaves fall into the external unit and make a lot of noise. If your HVAC system is not serviced regularly, you may have damaged parts or loose bolts which may cause rattling sounds and increase the noise levels of your machine. If you choose an HVAC system that is smaller than what your house actually requires, the fan of the unit will be working overtime to give you the cooling you desire. This will cause constant noise. If you have a larger unit than what is needed, it will cool faster no doubt, but it will also shut off quickly and some heat will re-enter. The unit will have to run again to counter this process. This means that the machine will be running over-time, causing noise, and increasing your electricity bills too. Most HVAC units have certain noise reducing features that you can look for. These are quieter than fans that run at a constant speed because they can work at lower speeds and also do not need to turn on and off as much as the other. They also conserve energy. 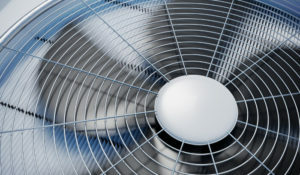 Sound can be reduced by installing HVAC units that have specially designed fan blades that do not make a lot of noise. Their shape makes them quieter even when running at a high speed. Choose HVAC units that have a low decibel rating. Quiet HVAC units generate sound that is below 60 decibels (a sound level that is considered comfortable). This is a separate cover that encases the external compressor and thus reduces noise coming from the outdoor unit. Many HVAC units come with an additional pan under the air conditioner. This prevents corrosion along with reducing noise.